This study was conducted in the Paleogene-Neogene Malatya Basin situated in Eastern Anatolia with particular focus on the analyses of the paleobiodiversity of the larger benthic foraminifera assemblage found in the late Lutetian-Bartonian Yenice and Asartepe members of the Darende Formation. Frequency, dominance, similarity analyses, population size, and diversity indices of the genera/species were obtained for the first time from the analyses of the paleobiodiversity data interpretation obtained by using the larger benthic foraminifera of the Yenice and Asartepe members. According to frequency analysis values, rarely, seldom, generally, frequently, and commonly observed genera and species were determined. The frequency analysis values of the genera were between 15% and 86% for Nummulites, 9% and 81% for Assilina, and 2% and 13% for orthophragminids. Species frequency analysis values were determined for Nummulites aturicus (2%-16.98%), Nummulites beaumonti (3.77%-5.88%), Nummulites maximus (0.94%), Nummulites perforatus (19.81%-61.36%), Assilina exponens (16.98%-67.65%), Nummulites sp.1 (11.32%), and Nummulites sp.2 (30.19%). The dominance analysis values were obtained as <5, 5-25, 25-50, 50-75, and >75 for genus and species. The values of the diversity index are between 0.66 and 1.2. Similarity analysis values among sections changed between 49% and 95%. The numerical results obtained from paleobiodiversity analyses also support the fact that the distributions of the larger benthic foraminifera changed in accordance with the hydrodynamic conditions of the depositional environment. The change of frequency analysis values of orthophragminids indicates sea level changes in the environment over time. When the species were evaluated with respect to their frequency and dominance analyses, it was observed that the orthophragminids had lower values than the larger benthic foraminifera. This indicates that the depositional environments of the late Lutetian-Bartonian Yenice and Asartepe members were not deep enough to convert from shelf to slope. Akkuş MF (1971). New information on the age of lithostratigraphic units and gypsiferous formations in the Darende-Balaban Basin (Malatya, Eastern-southeastern Anatolia). Bull Min Res Exp 75: 1-18 (article in Turkish with an abstract in English). Aksoy E, Türkmen İ, Turan M (2005). Tectonics and sedimentation in convergent margin basins: an example from the Tertiary Elazığ Basin, Eastern Turkey. J Asian Earth Sci 25: 459-472. Aktaş G, Robertson AHF (1984). The Maden Complex, SE Turkey: Evolution of a Neo-Tethyan active margin. In: Dixon JE, Robertson AHF, editors. The Geological Evolution of the Eastern Mediterranean. Oxford, UK: Blackwell Scientific Publications, pp. 375-402. Alan B (2011). Eocene (middle-late Eocene) benthic foraminifera description and biostratigraphy of shallow marine sediments in the Malatya Basin. PhD, Ankara University, Ankara, Turkey (in Turkish with an abstract in English). Avşar N (1994). Systematic investigation of some Nummulites species around the Akçadağ-Hasanağa Stream (W. Malatya, E. Turkey). In: Yetiş C, editor. Çukurova University Faculty of Engineering and Architecture 15th Anniversary Symposium Proceedings, pp. 277-290 (in Turkish with an abstract in English). Ayan T, Bulut C (1964). General geology of the area between Balaban, Yazıhan, Kurşunlu and Levent districts (Malatya). Bull Min Res and Exp 62: 58-70 (article in Turkish with an abstract in English). Barattolo F, Bassi D, Romano R (2006). Upper Eocene larger foraminiferal coralline algal facies from the Klokova Mountain (southern continental Greece). Facies 53: 361–375. Bassi D (1998a). Coralline red algae (Corallinales, Rhodophyta) from the upper Eocene Calcare di Nago (Lake Garda, northern Italy). Ann Univ Ferrara Sez Sci Terra 7: 50. Bignot G, Decrouez D (1982). Un planorbulinidae (Foraminiferida) nouveau du Priabonian et de l’Oligocene de l’Europe Meridionale et Occidentale. Rev Paléobiol 1: 141-163 (in French). Briguglio A (2008). Nummulites ein einfaches geometrisches Verfahren zur Bestimmung hydrodynamischer Parameter. Ber Geol Bundesanstalt 75: 8-9 (in German). Briguglio A, Hohenegger J (2009). Nummulitids hydrodynamics: an example using Nummulites globulus Leymerie. B Soc Paleontol Ital 48: 105-111. Bursch JG (1947). Mikropaläontologische Untersuchungen des Tertiärs Von Gross Kei, Molukken. Schweiz Paläontol Abh Mém Suisses Paläontol 65: 37 (in German). Çağlar M (2009). Benthic foraminiferal biostratigraphy of the Tertiary sediments from the Elazığ and Malatya basins, Eastern Turkey. J Geol Soc India 74: 209-222.
d’Archiac AD (1850). Histoire de progres de la géologie de 1834 â 1849, Paris, France. Soc Geol Fr 3: 241 (in French). d’Archiac AD, Haime J (1853). Description des animaux fossiles du groupe Nummulitique de I’’Inde precede d’’un resume geologique et d’’une monograph des Nummulites Paris. Gide te J Baudry 1: 373 (in French). De Montfort DP (1808). Concyologie systematique et classification methodique des coquiles Paris. Paris, France: Published by the Author (in French). Dinçer F (2009). Micropaleontological investigation and environmental interpretation of benthic foraminifera of Paleogene sequence in Darende Basin. PhD, Çukurova University, Adana, Turkey (in Turkish with an abstract in English). Dinçer F, Avşar N (2012). Benthic foraminiferal biostratigraphy and environmental interpretation of upper Lutetian-Bartonian units in Darende Basin (NW Malatya). Bulletin of the Earth Sciences Application and Research Centre of Hacettepe University 33: 31-58 (in Turkish with an abstract in English). Dunham RJ (1962). Classification of carbonate rock according to depositional texture. In: Ham WE, editor. Classification of Carbonate Rocks. Tulsa, OK, USA: American Association of Petroleum Geologists Memoirs, pp. 108-121. Erdoğan D (2003). Micropaleontological investigation and environmental interpretation of the Tertiary sequence in the south of Balaban (Darende-Malatya, E. Turkey). MSc, Çukurova University, Adana, Turkey (in Turkish with an abstract in English). Folk RL (1962). Spectral subdivision of limestone types. In: Ham WE, editor. Classification of Carbonate Rocks. Tulsa, OK, USA: American Association of Petroleum Geologists Memoirs, pp. 62-64. Gedik F (2010). Description and biostratigraphy of benthic foraminifera of the Oligo-Miocene shallow marine sediments in Malatya Basin. PhD, Ankara University, Ankara, Turkey (in Turkish with an abstract in English). Gedik F (2015). Benthic foraminiferal biostratigraphy of Malatya Oligo-Miocene succession (Eastern Taurids, Eastern Turkey). Bull Min Res Exp 150: 19-50. Gedik F, Sirel E (2009). New species Miogypsinoides akcadagensis n. sp. from a Chattian deposit from Akçadağ Region, Malatya, Turkey. Bull Min Res Exp 138: 35-43. Gürbüz K, Gül M (2005). Evolution of and factors controlling Eocene sedimentation in the Darende-Balaban Basin, Malatya (Eastern Turkey). Turk J Earth Sci 14: 311-335. Henson FRS (1950). Middle eastern Tertiary Peneroplidae (foraminifera) with remarks on the phylogeny and taxonomy of the family. PhD, Leiden University, Leiden, the Netherlands. Hohenegger J, Yordanova E (2001). Depth-transport functions and erosion-deposition diagrams as indicators of slope inclination and time-averaged traction forces: application in tropical reef environments. Sedimentology 48: 1025-1046. Hottinger L (1960). Recherches sur les Alveolines du Paleocene et de I’’Eocene. Mém Suisses Paléontol 75: 243 (in French). Joly N, Leymerie A (1848). Mémoire sur les Nummulites considérées zoologiquement et géologiquement. Acad Roy Sci Inscr Belles- Lettres Toulouse Mem 3: 171-218 (in French). Jorry SJ, Hasler CA, Davaud E (2006). Hydrodynamic behaviour of Nummulites : Implications for depositional models. Facies 52: 221-235. Karaman T, Poyraz N, Alan B, Bakırhan B, Kadınkız G, Yılmaz H, Kılınç F (1993). Malatya-Doğanşehir-Çelikhan dolayının jeolojisi. MTA Genel Müdürlüğü, Rapor No: 9587. Ankara, Turkey: MTA (in Turkish). Kaufmann FJ (1867). Geologische Beschreibung des Pilatus-beitr. Geol Katre Schweiz 5: 1-169 (in German). Kayğılı S, Aksoy E (2017). Thin section preparation from benthic foraminifera: an example from Hasanağa Stream (West of Malatya, Eastern Turkey). Science and Engineering Journal of Fırat University 29: 301-306 (article in Turkish with an abstract in English). Kayğılı S, Avşar N, Aksoy E (2017). A palaeontological geosite example: Hasanağa Stream, Akçadağ, Malatya. Geol Soc Turkey Bull 60: 93-105 (article in Turkish with an abstract in English). Kaymakcı N, İnceöz M, Ertepınar P (2006). 3d-Architecture-End and Neogene evolution of the Malatya Basin: inferences for the kinematic of the Malatya and Ovacık fault zones. Turk J Earth Sci 15: 123-124. Koç A, Kaymakcı N (2013). Kinematics of Sürgü fault zone (Malatya, Turkey). A remote sensing study. J Geodyn 65: 292-307. Kocataş A (2006). Ekoloji ve Çevre Biyolojisi. Genişletilmiş 9. Baskı. İzmir, Turkey: Ege Üniversitesi Yayını (in Turkish). Langer M, Hottinger L (2000). Biogeography of selected “larger” foraminifera. Micropaleontology 46: 105-126. Lattrache KM, Ozcan E, Boukhalfa K, Saraswati PK, Soussi M, Jovane L (2014). Early Bartonian orthophragminids (Foraminiferida) from Reineche limestone, north African platform, Tunisia: taxonomy and paleobiogeographic implications. Geodin Acta 26: 94-121. Le Calvez Y (1949). Revision des foraminiferes lutetiens du bassin de Paris II, Rotaliidae et families affines. Memories du Service dela carte Geologique Detaille de la France 1-54 (in French). Less G, Özcan E (2012). Bartonian-Priabonian larger benthic foraminiferal events in the western Tethys. Austrian J Earth Sci 105: 129-140. Liebus A (1911). Die foraminiferen Fauna der mitteleocaen Mergel von norddalmatien Sitzungsberichte der kaiserlichen Akademie der Wissenschaften in Wien. Mathematisch Naturwissen Schaftliche Classe 120: 805-956 (in German). Nazik A (1993). Micropaleontological (Ostracoda and foraminifera) investigation of the Tertiary sequence of Darende Basin. Geol Soc Turkey Bull 36: 13-26 (article in Turkish with an abstract in English). Nazik A, Gürbüz K, Erdoğan D (2006). Biostratigraphy and paleoenvironmental interpretation of middle Eocene sequence from Darende-Balaban Basin (Eastern Anatolia, Turkey). Geol Carpath 57: 91-101. Önal M, Kaya M (2007). Stratigraphy and tectono-sedimentary evolution of the upper Cretaceous–Tertiary sequence in the southern part of the Malatya Basin, East Anatolia, Turkey. J Asian Earth Sci 29: 878-890. Oppenheim PV (1896). Das attertiar der colli berici in venetien, die stellung der schichten von Priabona, und die Oligocane transgression in alpinen Europa Z eitschrift der Deutschen. Geol Ges 48: 27-152 (in German). Örçen S (1984). Biostratigraphy and paleontology of Medik-Ebreme (KB Malatya) and its surroundings. PhD, İstanbul University, İstanbul, Turkey (in Turkish with an abstract in English). Özcan E, Abbasi I, Drobne K, Govindan A, Jovane L, Boukhalfa K (2016a). Early Eocene orthophragminids and alveolinids from the Jafnayn Formation, N Oman: Significance of Nemkovella stockari Less & Özcan, 2007 in Tethys. Geodin Acta 28: 160- 184. Özcan E, Hanif M, Nowrad A, Yücel AO (2015). Early Eocene orthophragminids (foraminifera) from the type-locality of Discocyclina ranikotensis Davies, 1927, Thal, NW Himalayas, Pakistan: Insights into the orthophragminid paleobiogeography. Geodin Acta 27: 267-299. Özcan E, Less GY, Kertesz B (2007). Late Ypresian to middle Lutetian orthophragminid record from central and northern Turkey: Taxonomy and remarks on zonal scheme. Turk J Earth Sci 16: 281-321. Özcan E, Saraswati PK, Hanif M, Ali N (2016b). Orthophragminids with new axial thickening structures from the Bartonian of the Indian Subcontinent. Geol Acta 14: 261-282. Özcan E, Scheibner C, Boukhalfa K (2014). Orthophragminids (foraminifera) across the Paleocene-Eocene transition from north Africa: Taxonomy, biostratigraphy and paleobiogeographic implications. J Foramin Res 44: 203-229. Özçelik O (1992). Organic facies investigations of the Ulupınar Formation (Maastrichtian) at northwest of the Levent (Akçadağ-Malatya). Journal of Cumhuriyet University Engineering Faculty 41: 63-65 (article in Turkish with an abstract in English). Papazzoni CA, Cosovic V, Briguglio A, Drobne K (2017). Towards a calibrated larger foraminifera biostratigraphic zonation: celebrating 18 years of the application of shallow benthic zones. Palaios 32: 1-5. Parlar Ş (2010). The foraminifera of Plio-Quaternary sedimans and environmental interpretations in Belek (East Antalya) and surroundings. PhD, Selçuk University, Konya, Turkey (in Turkish with an abstract in English). Parlar Ş, Görmüş M (2012). Paleobiodiversity analysis of Plio- Quaternary foraminifera from the Belek coastal area (East Antalya). In: 65th Geological Congress of Turkey Proceedings, pp. 540-541 (in Turkish with an abstract in English). Penney S, Racey A (2004). Ecology of extant Nummulitids and other larger benthic foraminifera: applications in palaeoenvironmental analysis. Earth Sci Rev 67: 219-265. Racey A (1995). Lithostratigraphy and larger foraminiferal (nummulitid) biostratigraphy of the Tertiary of northern Oman. Micropaleontology 41: 1-123. Renema W (2007). Fauna development of larger benthic foraminifera in the Cenozoic of Southeast Asia. In: Renema W, editor. Biogeography, Time and Place: Distributions, Barriers and Islands. Dordrecht, the Netherlands: Springer, pp. 179-215. Reuss AE (1963). Beitrage zur Kenntniss der tertiaren foraminiferen fauna (Zweite Folge), Sitzungsberichte der kaiserlichen akademie der Wissenschaftewn in in Wien. Mathematisch Naturwissen Schaftliche Classe 48: 36-71 (in German). Romero J, Caus E, Rosell J (2002). A model for the palaeoenvironmental distribution of larger foraminifera based on late middle Eocene deposits on the margin of the South Pyrenean Basin (NE Spain). Palaeogeogr Palaeocl 179: 43-56. Şafak Ü (1990). The late Lutetian fauna of the northern Malatya (Medik-Ebreme Region). Çukurova University Engineering and Architecture Faculty of Journal 5: 135-156 (article in Turkish with an abstract in English). Schlumberger C (1893). Note sur les genres Trillina et Linderina . Bull Soc Geol Fr 3: 120. Serra-Kiel J, Hottinger L, Caus E, Drobne K, Ferrández C, Jauhri AK, Less G, Pavlovec R, Pignatti JS, Samsó JM et al. (1998). Larger foraminiferal biostratigraphy of the Tethyan Paleocene and Eocene. B Soc Géol Fr 169: 281-299. Sevimli Uİ (2009). The tectonostratigraphy of the western Yazıhan (Malatya). PhD, Çukurova University, Adana, Turkey (in Turkish with an abstract in English). Sirel E (2000). Biostratigraphy of the middle/upper Eocene/ Oligocene boundaries at the Eastern Turkey. Ann Mus Civ St Nat Ferrara 3: 61-70. Sirel E (2003). Foraminiferal description and biostratigraphy of the Bartonian, Priabonian and Oligocene shallow water sediments of the Southern and Eastern Turkey. Rev Paléobiol 22: 269-339. Sirel E, Acar S (1993). Malatya a new foraminiferal genus from the Lutetian of Malatya region (East Turkey). Geol Croat 46: 181- 188. Sirel E, Gedik F (2011). Postmiogypsinella , a new Miogypsinidae (foraminifera) from the late Oligocene in Malatya Basin, Turkey. Rev Paléobiol 30: 591-603. Solak S (2011). Tectonic stratigraphy of Levent (Akçadağ-Malatya Batısı) and its surroundings. MSc, Çukurova University, Adana, Turkey (in Turkish with an abstract in English). Sowerby J (1840). A notice respecting some fossils collected in Cutch by Capt. Walter Smee, of the Bombay army. Trans Geol Soc London 2: 715- 719. Sowerby J (1850). The Geology and Fossils of the Tertiary and Cretaceous Formations of Sussex. London, UK: Longman, Brown, Green, and Longmans. Van Soest J (1942). Geologic und paleontologic des Zentralen Biokova (Dalmatien), geographische en goelogische Mededeelinger. Physiographisch Geologische Reeks 2: 1-42 (in German). Vecchio E, Hottinger L (2007). Alveolina horizons in the Trentinera Formation (Southern Apennines, Italy): stratigraphic and paleogeographic implications. Riv Ital Paleontol S 113: 21-42. Yazgan E (1984). Geodynamic evolution of the eastern Taurus region. In: Tekeli O, Göncüoğlu C, editors. Geology of the Taurus Belt. Proceedings of International Tauride Symposium Mineral Research and Exploration Institute of Turkey Publications, pp. 199-208 (in Turkish with English abstract). Yazgan E, Chessex R (1991). Geology and tectonic evolution of the southeastern Taurides in the region of Malatya. Turk Assoc Petr Geol 3: 1-42. Yoldaş R (1972). Malatya kuzeyinin jeolojisi ve petrol olanakları. MTA Genel Müdürlüğü Rapor No: 4936. Ankara, Turkey: MTA (in Turkish). ISNAD KAYĞILI, Sibel , AKSOY, Ercan . "Interpretation of sea level change using paleobiodiversity analysis: the Darende Formation of the Eocene (Malatya Basin, East Turkey)". 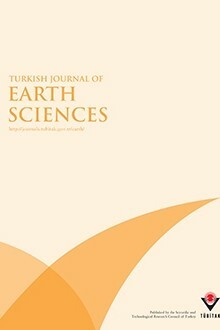 Turkish Journal of Earth Sciences 28 / 1 (January 2019): 146-170.